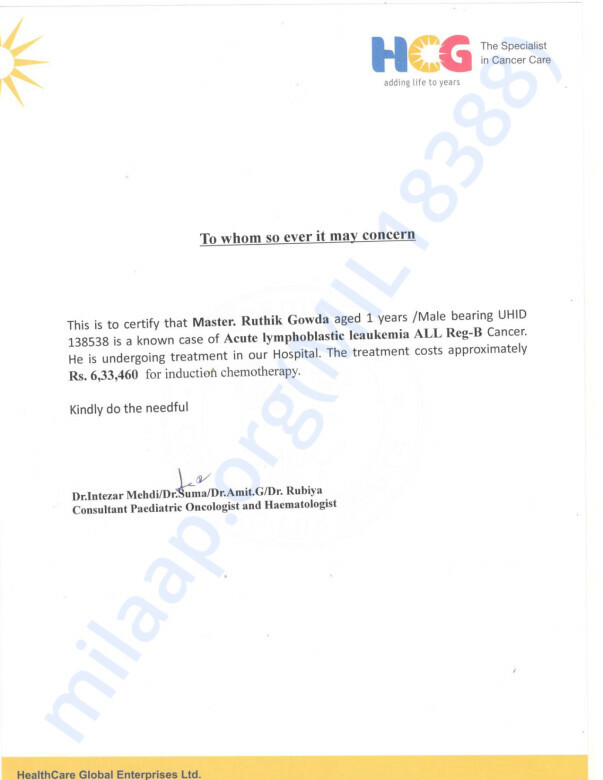 2 Year old Ruthik has been diagnosed with White Blood cell Cancer. He needs your support to undergo treatment for it. Ruthvik had just completed one year when they found a lump in his neck. When they took him to the hospital – a cancer diagnosis was the last thing Srinivas and Chaithra expected. Ruthvik needed an immediate operation that removed the cancerous lump. Not one, but three lumps were removed from Ruthvik's body and he started chemotherapy immediately. Finding the money for the treatment has been an uphill struggle for Srinivas. They sold off what little possessions they had to make sure Ruthvik got his treatment. 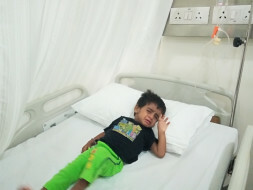 Ruthvik has a very good chance of recovery if he gets the right treatment before the cancer spreads. The last few months have been a very difficult time for them, but not once did these brave parents give up hope. Your contribution will help them save their child's life –making their painful struggle worth it. Thank you for the love and support you have shown towards Ruthik. Here is a quick update on his health. Currently Ruthik is on maintenance chemotherapy and has shown good signs of improvement. He had fungal infection but has now recovered. He is on medication as prescribed by the doctors. Thank you for the support that you have shown towards Ruthik. He underwent the 4th cycle of chemotherapy. His health is not that stable so the doctor has advised to take supportive care along with Chemotherapy. Here is a quick update on Ruthik. Currently, he is doing fine. Ruthik has undergone his third cycle of chemotherapy and has been going supportive care since the month of December. Will keep you posted on the progress of his health. Thank you so much for your love and support.